Strawberries, while technically being self-pollinating, do benefit from some help. 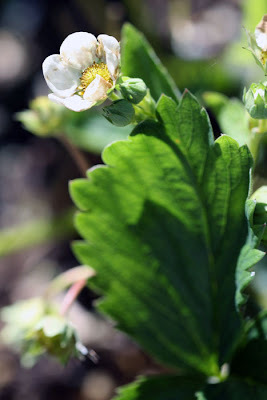 Many gardeners find that hand pollination of their strawberry plants produces a better yield. Hand pollination is commonly used in greenhouses in lieu of bees, and it's a useful tool to know about. My strawberry plants are thriving, but as I write this, they're not producing the quantity of fruit that I would like. I have tried all sorts of things including watering more and trimming off the runners, but it hasn't really made a difference. The one thing I haven't tried yet is hand pollinating. Now I'm going to!